In this edition of BTW Revealed, The article of Thimon Dokter. 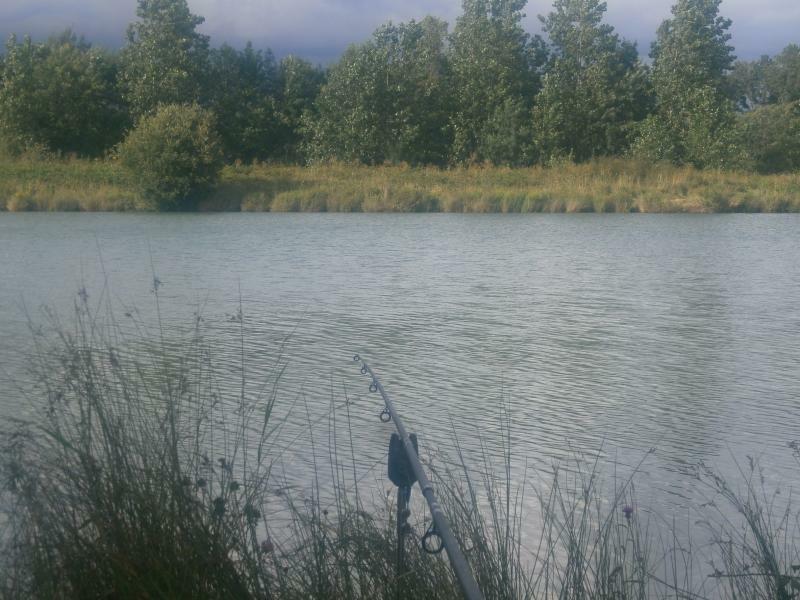 He went for an independent review to over carp fishing venue, Etang de la Livardière. His expectations are high, but is it possible for Thimon to achieve the result he is hoping for? You read it in this article. 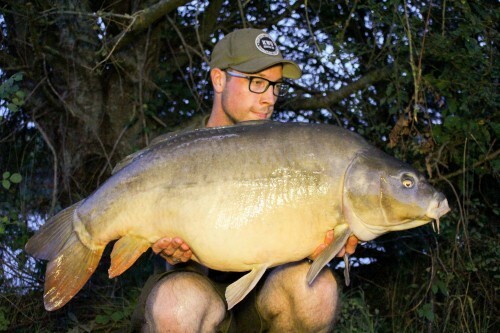 Thimon left the 24th of September to fish at Etang de la Livardiére, near the big city Le Mans. 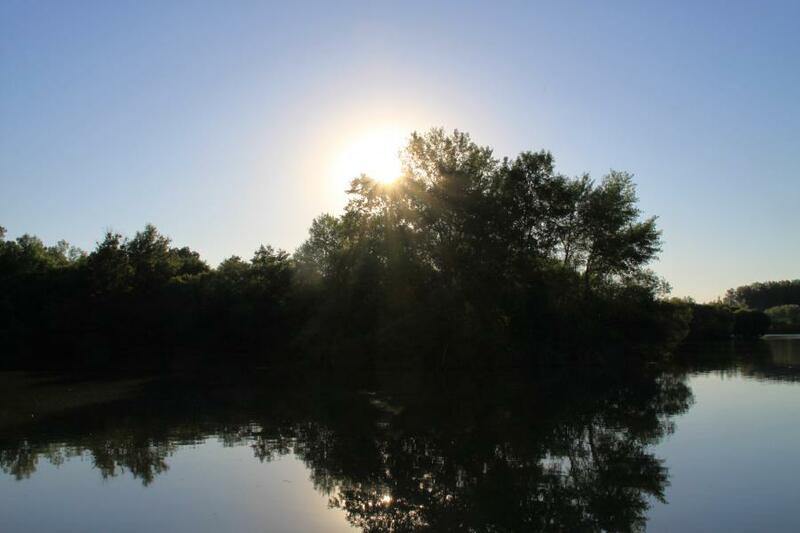 The lake is surrounded by beautiful surroundings and against a 1000-acre forest. With the directions from The Carp Specialist, it was very easy to find the way to the lake. From the moment I arrived, my vacation started. 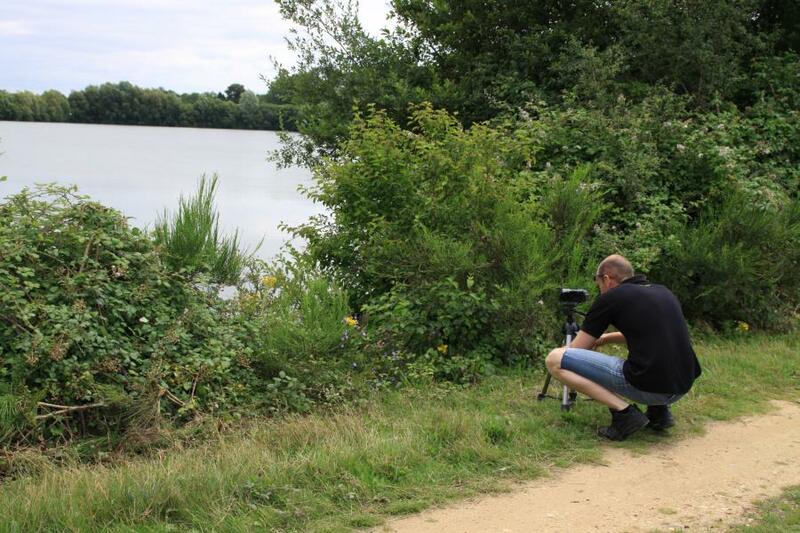 Almost every week there are anglers on Etang De La Livardiére, so they carp are familiar with our tactics. This is also why I don't recommend this lake for a beginning angler. 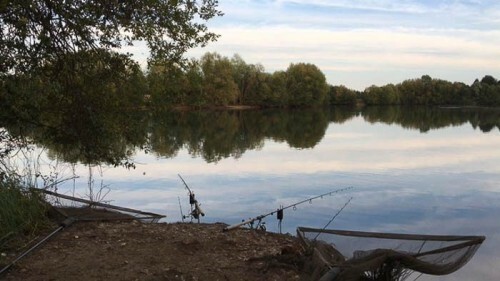 There are 7 swims at Livardière, and it can fit up to 12 anglers, and most swims are booked continuously during the season. The lake is closed from November 1 till April 1 for the hunting season on the domain. Also, this has a positive effect on the carp so they can rehabilitate. With a depth chart like this, you can get a lot of interesting information. On this depth map of Etang de la Livardière, you see orange, yellow and red parts. These are the shallower parts between 3 and 5 feet. The deeper parts are blue and the deepest known, dark blue. These depths are between 5 and 9 feet. Personally, I find it very helpful to use a bait boat. For the most part, I use him to drop my rigs. Since I'm fishing in France, I have fished all types of lakes, lakes where it was hard to catch any carp and lakes where it was super easy called. After fishing al those years in France, I did up some experience, some experience that I could use on Etang de La Livardiére. 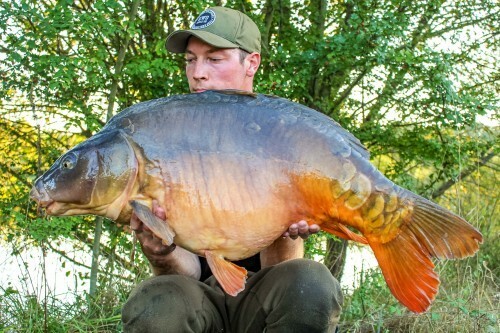 Is it hard to catch carp at this lake? How where the catch reports this month last year? How was the weather lately? What bait is used mostly at the lake? What size is the lake? Are there any obstacles or snags along the bank or underwater? Are there any other fish species? What are the depths and bottom structure? 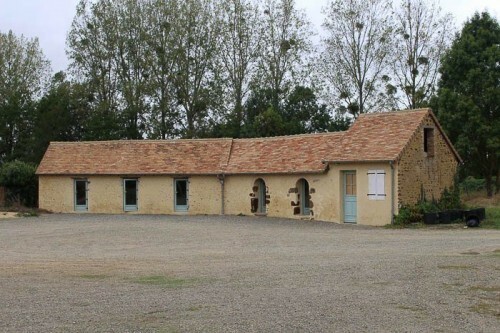 At Etang de la Livardière, the facilities are top-notch. There is a spacious building at the lodge that is fully equipped. 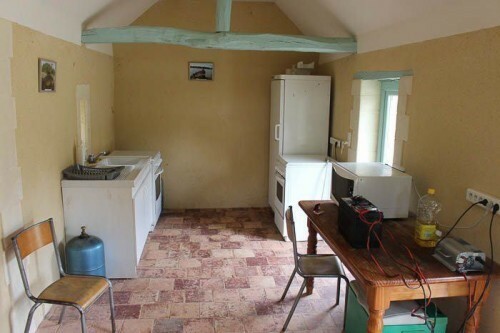 There are two shower cabins, two toilets and washbasins available. In addition, you have access to multiple freezers and refrigerators. For those who want to recharge batteries, telephones etc. there are more than enough outlets available (PS: don't forget your UK plug converters). There is also a sink where hot water comes from the tap. Very handy for doing the dishes. In short: the bathroom is in good order! The bottom of Etang de la Livardière is mostly a mix of sand, clay and hard places of gravel. In summer there are some weedy areas but not too many. There are many places where trees along the water stand with overhanging branches. Especially on site 3 and 4 around the islands. The swims are spacious enough and offer all possibilities. However, the ground can be hard, so bring a hammer for your poles. When I arrived at the lake, I was blown away by everything around me. The beautiful lake and its environment make it a beautiful scenery. When I arrived, I prepared some coffee and started thinking about my tactics. The owner tells me that the carp are on their guard and they know that there are anglers around. I was thinking, and I came to the conclusion that I need to use pin-point rigs, so the fish will be hooked immediately. I decided to fish slack lines up here. The swim lends itself well for this, and I do not have to fish at extreme distances. In addition to this approach regarding material, I prefer fishing with small bait. By this I mean bait with a size between 8 and 15 mm. 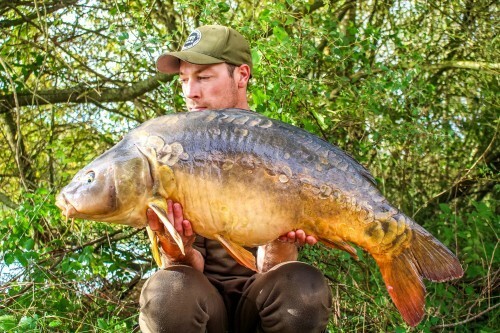 This mainly concerns small boilies, tigernuts and pellets in different shapes and sizes. For example, I used half boilies, black tigernuts, pellet and wafters. I already had a good look of the bottom with the fishfinder on my bait boat. I always take my time for this because I would like to be 100% sure. After all, this can make the difference between catching or blanking. I found a few interesting places where I will position my rigs. These spots are harder places with some gravel and stones. 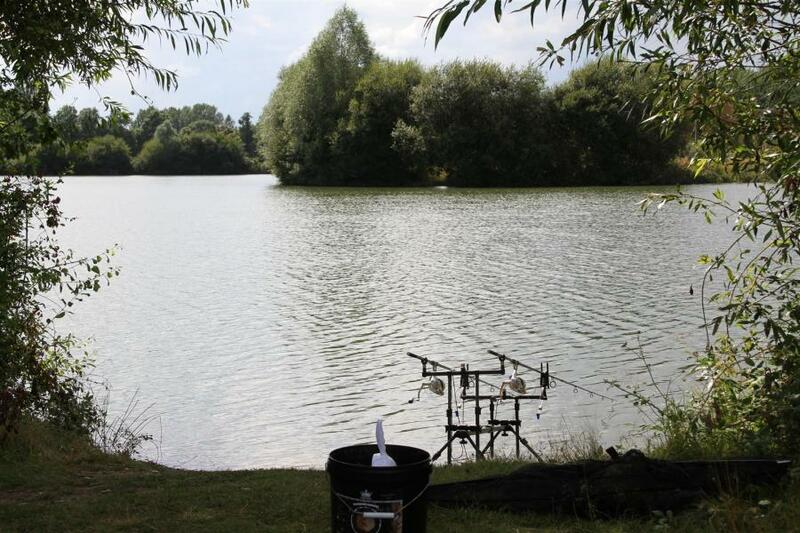 The ideal locations for the carp to come feed. I decide to put the 4th rod on a softer spot piece with a nutrition rich soil. Betting on one horse is not something that fits my approach. As I said, I fish with slack lines at Etang de la Livardière. This so I don't disturb the feeding carp. Also, you can reduce the so-called line pressure considerably. Of course, there is a line in the water, but the more natural this line behaves, the less it will disturb the fish. On Saturday evening, the day of arrival, I started building my bivvy. When I was busy with the bars, my first bite alarm started screaming. I immediately notice that this was a big carp, because of its slow movements. 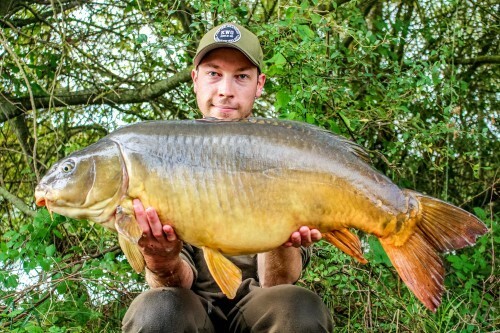 After a long drill of 30 minutes, a large mirror carp showed himself on top of the surface. The scale showed me 39lb, a fantastic start! Just when I was returning the mirror back in is habitat, and I could realise that this was a good start of our week, a second take was there! 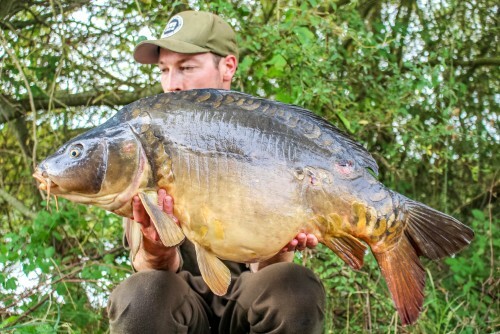 When I picked up the rod, I realised this was even a stronger carp...The fish went for open water and threw its weight in the battle to take some meters. Finally, after a drill of 1 hour and 10 minutes, I could slide my net underneath a 50lb+ mirror! 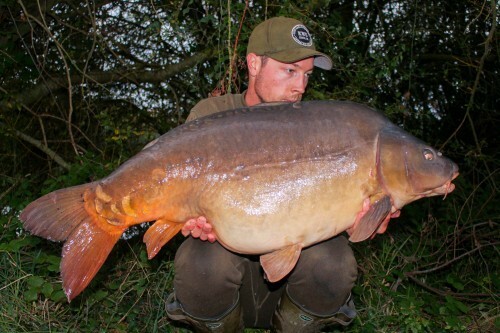 This big girl got caught on an 8mm wafter pellet... the power of small baits and short rigs. After catching this beautiful fish, I decided to close my eyes. The journey, the environment and fishing up here are making this lake very special for me. I was tired and forced me to take some rest. During that night I only caught one other fish. A long grass carp. Waking up in this environment is even better than I expected... whistling birds, the wind blowing through the trees and kingfishers flying back and forth over the water, fantastic! I was told that during the day you could not experience a lot of action. 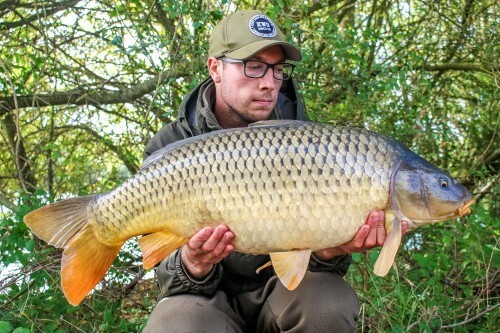 When I took the first sip of my coffee, a carp showed me the opposite... after a nice drill, I could slide the net under a nice common carp of mid-20lb. Unfortunately, the two following nights ended in a blank. In the time without a bite, I have regularly observed, checked my rigs dropped them so secure as possible. I decided to continue fishing with the same technique that worked in the first time. It was an excellent choice to be patient because that night I caught 3 carp. Those 3 carp where amazing, I had almost no time between one another. Again, 3 mirror carp and beautiful sizes. 33.7, 34, 41lb. These three mirrors make my night more than complete. What a great session! Because the fish were caught just before sunrise, I waited a short time to make some stunning pictures. The next day I decided to give my swim some rest. In this way, I create as little suspicion as possible so the fish won't feel that much pressure on this side of the lake. Meanwhile, I treated myself to an afternoon of culture sniffing around Le Mans, the big city located near Etang de la Livardière. I also do my shopping, so I have all my supplies and can return to my swim. Before I dropped my rigs, I first observed the lake for information. I saw a fish jumping, so I placed one of my rigs on this spot. The second rod goes to the spot where I already had a few bites and the third one, in a new place. The fact that my first choice was the right one turns out to be the number one in the evening, after a really tuff drill I caught a fantastic mirror carp of 39lb. That morning there was another fantastic carp. 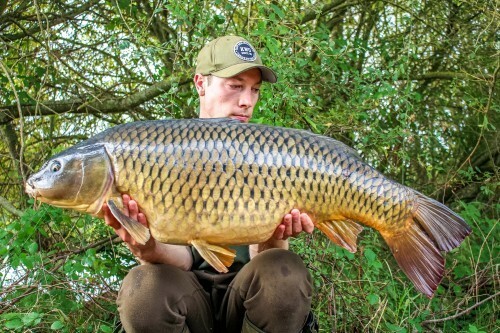 It was a stunning common carp of 42lb. During the day there was not a lot of actions, the only fish we caught where breams. A good reason could be the fact I was using tiny baits and pellets. I didn't bring any bigger baits, but I would highly recommend bringing those when the bream are showing up. If I have to rate Etang de la Livardière in numbers, the lake and its surroundings score a 9 out of 10! What do you think? And are you coming back? 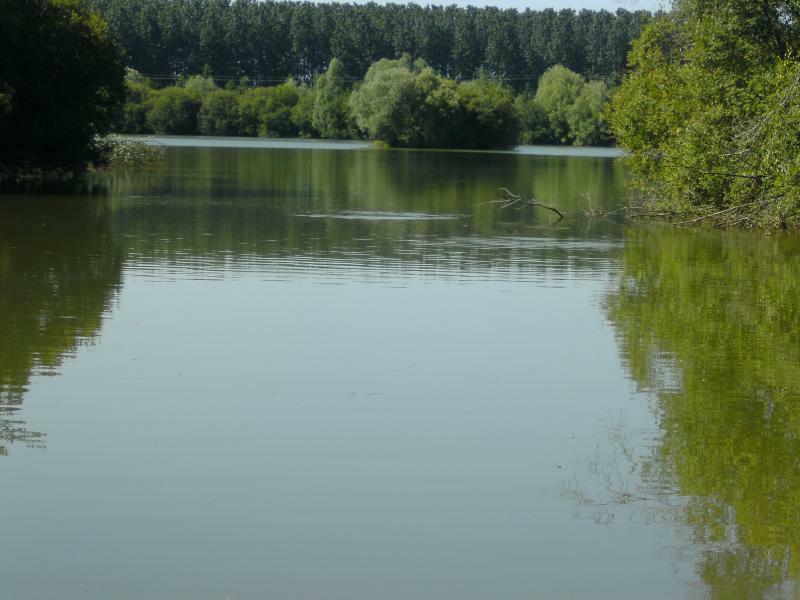 Personally, I think Etang de la Livardière is a fantastic, beautiful lake with lovely fish stock. Especially the level of difficulty of the water is what appeals to me. I like to work for a fish, so the reward is even bigger! 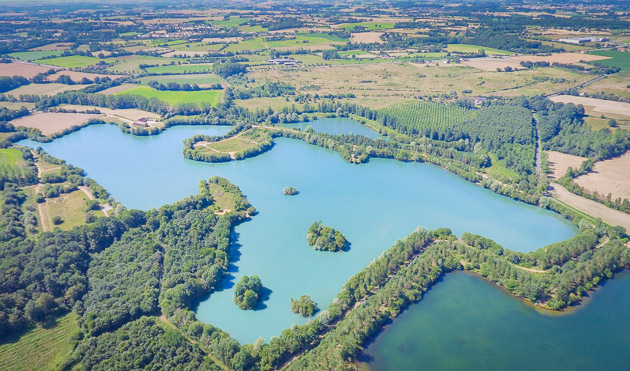 I highly recommended Etang de la Livardière for anglers who prefer beautiful surroundings and a real challenge. The chance is big to break your PB up here. Big carp enough! Personally, I have had a great time, and I have even booked for another holiday up here.